Music is one of the best things in this world. It can take us in so many different places while we remain sitting or standing still. It plays with our imagination and emotion. We use it to express and impress. Everybody loves music. Everybody listens to music. Unfortunately, not everyone can play music. At a young age, we were taught the fundamentals of music at school. We learned a few basic things, maybe a few chords and note descriptions. Some of us continued to play as we grew up and got better at it, some stopped. And while it is important we get exposed to these pieces of information early, while our minds are still developing, you should still be encouraged to learn to play music at any age. 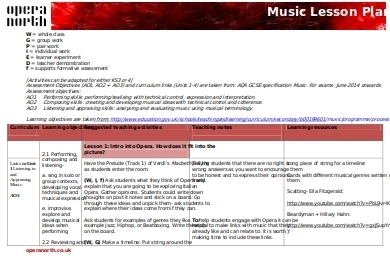 With that said, here are a couple of music lesson plans for you to utilize. Begin your journey to rock stardom with this lesson plan. Or if you just want to learn music for the sake of playing music, that is completely fine too. Start from the basics and rise your way to the advanced techniques slowly but surely. How long that will take is completely up to you. For most people, it will take years and years of practice. Some gifted prodigies only require a couple of months. 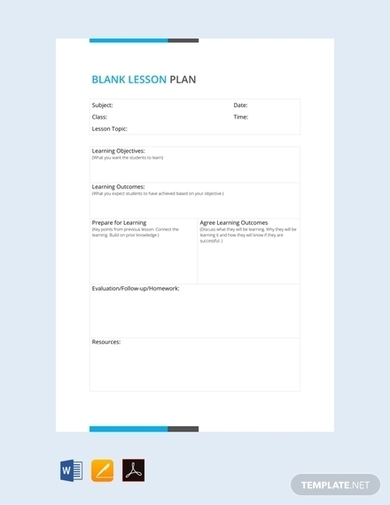 This blank plan can be used for anything. 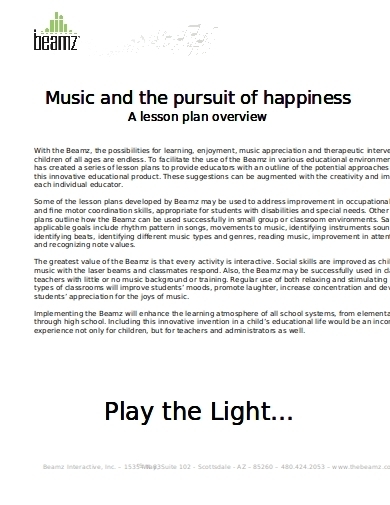 But to accommodate with our purpose here, which is music, we will utilize this lesson plan for that. This is perfect for people who have no experience of playing music in any way, shape, or form. 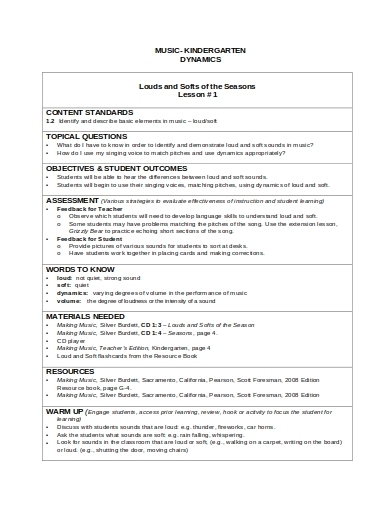 You can basically start from scratch and build your way up with this lesson plan. 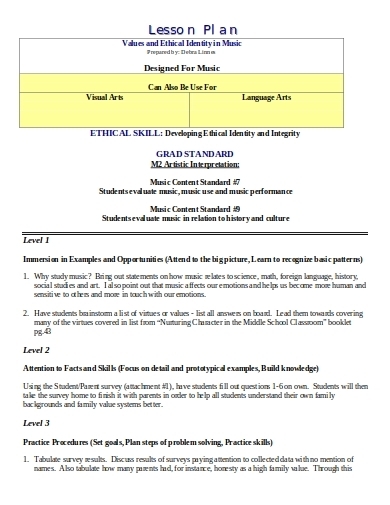 A sample music lesson plan intended for elementary students. The lessons tackled here will still be easy but will already require a fundamental knowledge of the craft. You will either find these lessons unnecessary or extremely important. Your rise to the musical ladder will depend on how you find these types of lessons. 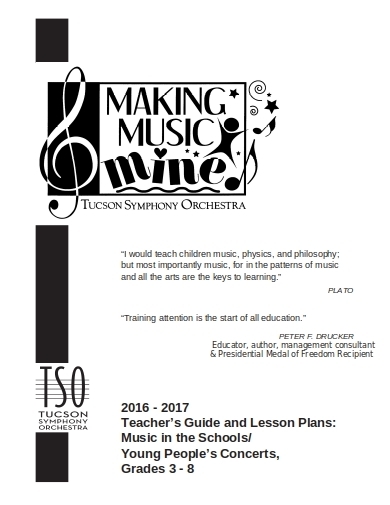 A lesson plan that tackles the importance, usage, and evaluates all the other aspects of music outside of performance. A lot of people who know how to play music do not understand these kinds of values. Make sure you do as it is of great importance if you really want to become a great musician who plays on massive festivals. 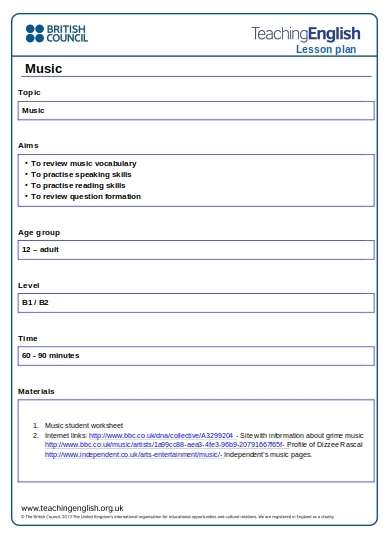 A different music lesson plan that tackles the vocabulary of the music world. There are jargon and complex terms in music that will sound gibberish to many. If you want to excel as a music player, it is essential that you learn and understand the meaning behind these terms. This music lesson plan talks about the magic of orchestra. Its introduction, the performance, composition, so and so forth. Opera is a highly complex form of music playing. It requires the comprehension of music sheets, which not all musicians are capable of doing. It also required that you understand the importance of playing in a group and knowing your role. Being in an orchestra is to be a cog in a machine. You have to play your part well if the machine is to remain functional. 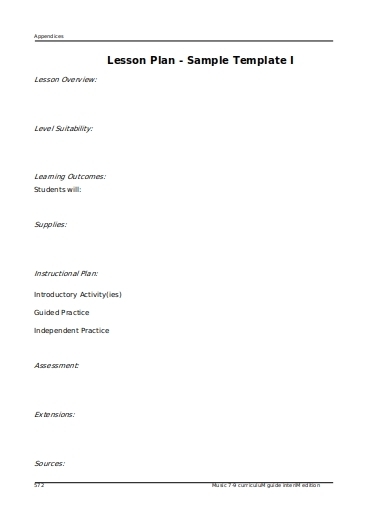 This sample lesson plan is intended for intermediate players. No longer should you dwell on the novice level, practicing basic chords and scales. 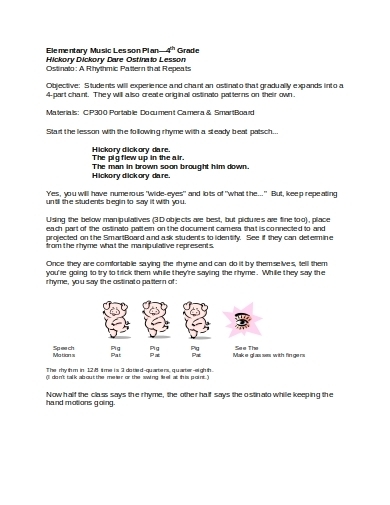 You are now obligated or forced to step up starting with this lesson plan. But make sure you are ready for this step by being fully knowledgeable of the fundamentals. Remember where you began, as it will help carry you to where you are heading. This is where all, or almost all, musicians begin. Level 1. Kindergarten level music lessons are the basest things you have to know and learn in music. Do not take these for granted, though, because every expert musician has started out here. This particular lesson plan tackles the rhythm aspect of music. Knowing the beats, adhering to tempo, and being familiar with different time signatures are important skills in music playing and it is even more important if you are a dancer. This may seem easy and basic to you, but some people actually have a hard time keeping up with tempo. 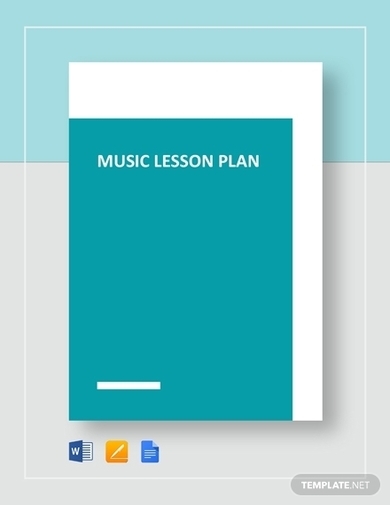 Perhaps this music lesson plan is tailor-fitted to them. This music lesson plan talks about being able to follow rhythmic patterns. That is something every musician should know, of course, but this lesson plan also talks about being happy in music and instruments appreciation. It is almost always certain that these things just come to us without the help of a lesson plan, but to read it on paper reminds us of the fact that we should play music because it makes us happy. That may not be the only reason why, but it should at the very least be at the core. Music is everywhere. That may sound cliché, but it is true. You can create music no matter where you are. Whether you are at home, in school, at work, just with the clap of your hands and a stomp of a foot, you can already create beats to follow. But that is just one aspect of it. To really play music is to learn many things and apply them with an instrument. It will be difficult at first, but it will all so much worth it in the end. After all, no one has ever regretted picking up and learning an instrument.